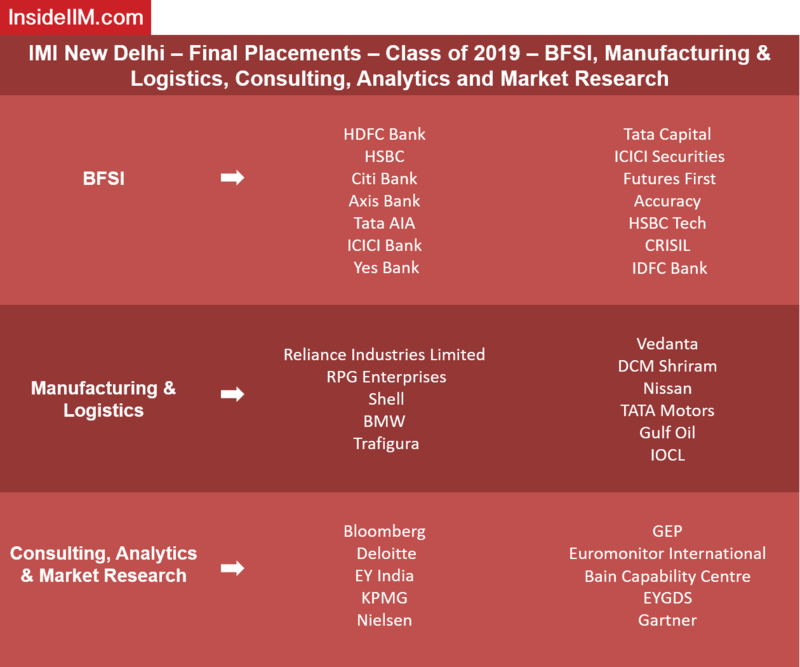 The IMI New Delhi Final Placements report for the Class of 2019 has been released! A total of 218 students participated in the final placements process of the PGDM batch of 2017-2019. The final placements process saw 102+ recruiters and 50 students received pre-placement offers from their dream companies, a 25% increase from last year. 46% of the recruiters on campus consisted of new recruiters. 39% of the batch opted for roles in the BFSI sector, followed by 21% in Consulting and 16% in the IT sector. Top brands on campus included HSBC, Citi Bank, Reliance Industries Limited, Shell, Tata Motors, Hindustan Unilever, Reckitt Benckiser, Nestle, Asian Paints, Piramal, EY India, Gartner and Deloitte among others. BFSI – Within this sector, IMI New Delhi witnessed top companies offering profiles under Corporate Banking, Corporate Finance, Equity Research, Credit Rating and Wealth Management. Almost 40% of the batch opted for roles in this sector. Manufacturing & Logistics – Within this sector, IMI New Delhi witnessed industry leaders and top conglomerates offering profiles in Operations, Supply Chain Management, Sales & Marketing. The highest CTC offered was in this sector. 9% of the batch opted for roles in this sector. Consulting, Analytics & Market Research – Within this sector, top recruiters included Bloomberg, Deloitte, EY India, and Nielsen among others. This was the second most preferred sector for IMI New Delhi students, with 21% of the batch opting for roles in this sector. FMCG/FMCD/Real Estate/Retail/Media – Within this sector, industry heavyweights offered profiles in Corporate Finance, Operations, Sales & Marketing and Supply Chain Mangement. Key roles were offered by industry giants HUL, Nestle, RB, Emami, Asian Paints, Piramal and IKEA among others. Other leading recruiters included Oyo Rooms, Zomato, Sony Pictures Network among others. 7% of the batch opted for positions in this sector. IT/ITES – This sector saw offers from exemplary recruiters such as Accenture, Mahindra Comviva, Wipro and Infosys among others. 16% of the batch opted for roles in this sector, making it the 3rd most preferred sector amongst IMI New Delhi students. 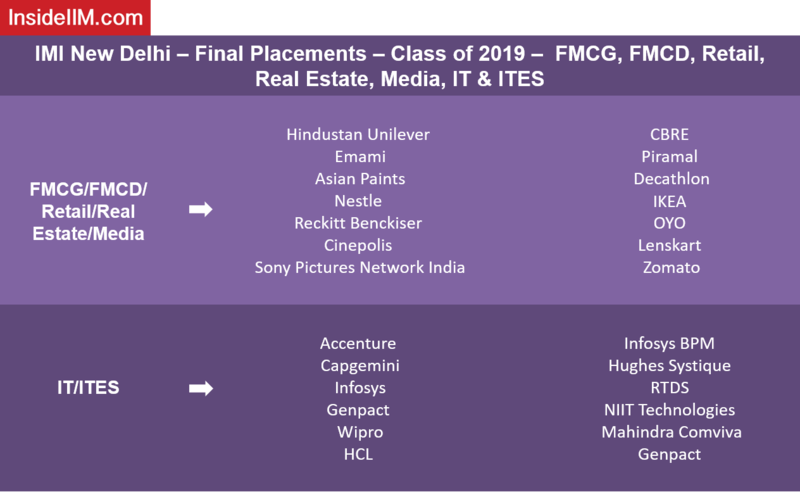 Click here to view the complete final placements report for IMI New Delhi’s PGDM, PGDM-HRM, & PGDM-BFS batches.